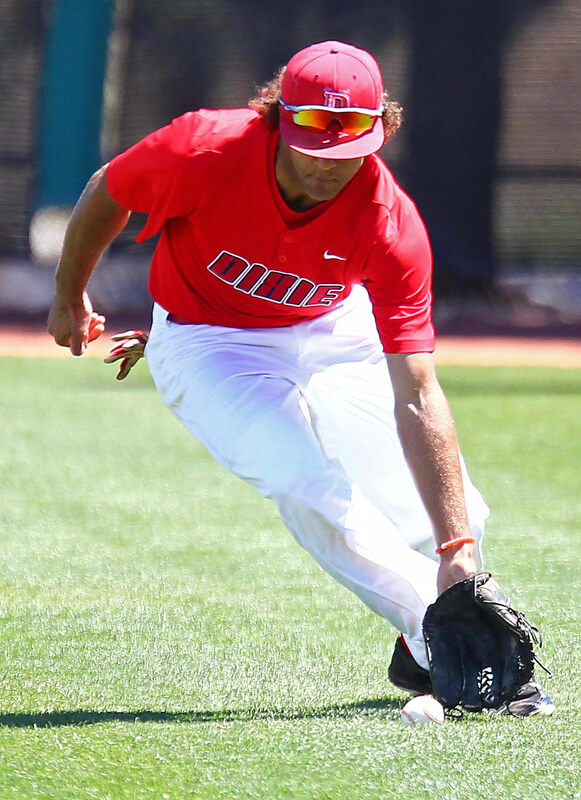 ST. GEORGE – After taking the first three games of the their series with Point Loma with ease, the Dixie State Trailblazers had to gut out the last game and come back twice. They had to score a run in the seventh to extend the game and then they had to score four runs in the bottom of the ninth to get the win. In the first game, the Trailblazers looked at an early deficit. After putting up the initial score with a Logan Porter single in the first, DSU saw the Sea Lions score four in the third. Porter got two more RBIs in the fifth when he hit a two-run home run to left field. The Sea Lions kept the lead all the way to the bottom of the eighth, when the Dixie State bats came alive. Porter got aboard after being hit by pitch. Tyler Mildenberg then reached on a throwing error after laying down a sacrifice bunt. Bryce Feist then singled to right field to score Porter. Miles Bice singled to left to score Mildenberg. Jake Davison bunt-singled to load the bases. Reece Lucero then drew a bases-loaded walk to score Feist. Tyler Baker then hit a two-run single to left field. Drew McLaughlin then bunt-sacrificed the runners to second and third. Trey Kamachi’s single to left field scored the two base runners. By the time the inning ended, the score was 10-4. The Blazers have 10 players batting over .300. Four of those are batting over .400, led by Kamachi’s .438. Tanner Howell then entered the game to close it out. Preston Hannay started the game and pitched six solid innings. He allowed three runs (two earned) on seven hits, striking out six. Jose Rosales-Rodarte (2-0) got the win in relief. He teamed up with Howell and Brad Danzeisen to pitch three scoreless innings allowing only one hit. Porter and Bice each had three hits to lead the team. McLaughlin and Feist also had multiple hits. The Sea Lions’ best chance to come away with a victory in the series came in the closing game. They scored one run in each of the first two innings. DSU matched them. An RBI single by Porter in the first and a sacrifice fly from Jake Engel in the second knotted the score at 2-2. In the third, Dixie State got its first lead of the game when Porter batted in McLaughlin. The Trailblazers kept that lead till the sixth inning, when Point Loma put up two runs to take a 4-3 lead. With the game scheduled for seven innings, the Trailblazers had to score at least one to prolong the game. They did just that in the bottom of the seventh. With two outs, Baker reached on a throwing error. McLaughlin then reached on a fielding error. Baker scored on the play to knot the game. The game went to extra innings and in the ninth, the Sea Lions’ Colby Kaneshiro doubled in two runs and then scored later on a wild pitch. PLNU held its largest lead of the series, 7-4. After the initial batter struck out for Dixie State, Baker opened up the hitting with a double down the left field line. McLaughlin then singled to center field, advancing Baker to third. Kamachi and Porter then both hit RBI singles to pull the score to 7-6. Mildenberg then laid down a bunt, beat out the throw and scored Kamachi to tie the game. Kade Cloward then entered the game to pinch run for Porter. Cloward became the winning run when Jake Davison singled to left field. Dixie State improved to 24-6 overall and 13-3 in the PacWest. Statistically, the Blazers are a game up on Azusa Pacific for first place. Percentage-wise, they sit in second behind the Cougars. Going winless in the series dropped Point Loma from first to fourth place. They are now 8-4 in the conference and 16-8 overall. The Trailblazers will now travel to Fresno, Calif., to take on Fresno Pacific. They will begin their four-game series with a game Thursday night. That will be followed up with a doubleheader on Friday and another single game on Saturday. Game time Thursday is scheduled for 6 p.m. Pacific Time.